FILE - A rebel fighter runs through dust towards an area damaged by what activists said were barrel bombs dropped by warplanes loyal to Syria's President Bashar al-Assad in Aleppo, Nov. 6, 2014. A new study finds warring factions in Syria’s long-running civil war have damaged or destroyed hundreds of Syrian cultural heritage sites. The study by UNITAR, the U.N. Institute for Training and Research uses detailed satellite imagery, which tracks and analyzes the extent of the loss. More than three years of civil war in Syria has killed an estimated 200,000 people and displaced more than nine million both within and outside the country. A new U.N. study finds this heavy human toll is being compounded by the extensive and grievous loss of much of Syria’s cultural heritage. Einar Bjorgo, the manager of UNITAR’s Operational Satellite Applications program (UNOSAT), tells VOA satellite images show widespread damage to mosques, old ruins and other cultural sites, including UNESCO World Heritage Sites. 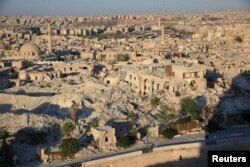 Bjorgo says battle-ravaged Aleppo, where settlements have been in place for more than 7,000 years, has been exposed to major damage. So have sites in other areas, including Damascus, Raqqa and Palmyra. He says U.N. experts have looked at 18 different cultural heritage areas and analyzed 290 locations inside these sites to see how they have been affected during the last three years of war. “Twenty-four are completely destroyed, 104 are severely damaged, 85 are moderately damaged, and we also observed possible damage to 77 of these locations. So, it is quite large, quite dramatic. And, again, it is happening all over the country. That said, most of these cultural heritage areas are located in the Western part of the country,” he said. UNITAR has been analyzing satellite imagery to support the international humanitarian effort in Syria since the start of the conflict in March, 2011. While helping the civilian operations, Bjorgo says the startling damage being done to cultural heritage sites also became clear. He says this prompted the agency to undertake a comprehensive study of these historic structures. He says the findings are alarming. “Clearly, most of the damage is deliberate for one reason or the other. For example, blowing up with explosives very old and culturally important buildings, also, sites being bombarded with aerial bombardment. In addition, we also see-and that is clearly very intentional, looting. We see holes being dug in the ground inside specific heritage sites,” he said. Looted artifacts from Syria reportedly are being sold for tens of millions of dollars on the international market. Bjorgo says the satellite images do not pinpoint who is responsible for the looting or the destruction. The study provides compelling and alarming testimony of the ongoing destruction of Syria’s vast cultural heritage. The United Nations warns this irreplaceable heritage is being obliterated. It urges national and international action to protect and to save these precious treasures from being lost for all humankind. Images copyright US Department of State, Humanitarian Information Unit, NextView License (DigitalGlobe). Satellite Imagery Analysis by UNITAR-UNOSAT.